Have you taken sides yet? Yeah, I’m actually a hero of the revolution (Tacketies), which helped with my ambition. Made it to Albion. Pro-tip: London is (probably?) in the middle of the map, just to save you wandering around with less than a fuel tank left hoping to run across it. Who gave out that quest? So far all I can do is kill the Tacketies. Speaking of which since I accepted that mission, can I still accept the one from the Tacketies? You have to go to Lustrum. And yes, you can accept both. To me, Sunless Skies does a couple of fundamental things that make it better than Sunless Seas. In many ways it feels like a 2.0 successful iteration off a fantastically interesting proof-of-concept first game. It seems as if it randomizes locations between saves; if you explore a lot after the autosave at a port and then die, the stuff you uncovered seems to reconfigure within limits. That’s very cool if that’s what’s happening. By allowing both roguelike and older save models, there’s replayability too. For my first game, I’m playing on Merciful mode. I’m definitely going to start a game in roguelike mode eventually. Both this game and Sunless Seas were games about exploration. But Sunless Seas almost didn’t want you to explore it too quickly, because of the smaller overall map, and the non-random, static map nature of individual legacies in its roguelike structure. As a result, fuel burns quickly, which impacts your ability to earn, and the early game can be a tremendous grind to find traction. In Sunless Skies, as long as you leave big faction ships alone early, you can do a ton of exploring and get on top of finances fairly early, because you’re burning fuel and supplies at a much slower rate. Sunless Skies explains itself a little more, and when it explains, it’s more clear, without treating the player like a dummy. This is one of those situations where the loss of a creatively brilliant guy like Alexis Kennedy may have been points in Sunless Skies’ favor. There’s so much potentially going on in Sunless Skies and so many more areas to explore that without a little hand-holding at the start I’d feel overwhelmed, I think. Kennedy’s approach of figuring out the game’s framework as you play serves his Cultist simulator brilliantly, and served Fallen London well also. Finally, I think I like the trading in Sunless Skies, even though I know that’s a fairly idiosyncratic choice on my part. I know part of the “game” of games with trade in them is figuring out which ports are buying and selling goods at various rates, so you can figure out how to arbitrage things to make maximum profit. And I know I’m probably in the minority on this, but I think I’ve done that enough in games, thanks. Just tell me the bronzewood I’m buying at this port is a bargain. Make only one port at a center hub the buyer. It’s super streamlined, but that’s OK. Trade is an element of Sunless Skies, but this game knows it can’t be as good a trade sim as other stuff out there, and so it doesn’t try. And I’m so good with that design decision. EDIT for clarity on randomization. I’m confused by your statements as Sunless Sea had its map randomized as well. Sorry, I meant the randomization in-game. In Sunless Seas, where you have legacy captains, the map stays as it is as long as you’re within that legacy. In Sunless Skies it maybe does the same thing? But in Merciful Mode, if you’re exploring and uncover a lot of stuff and then die and restart from an earlier spot, it seems to randomize the areas you uncovered after that save point. Cool! Now I have to figure out where that is! Another question for anyone. What if I blow up both sides ships? Lustrum was the last port in The Reach that I found. If The Reach is the Wild West, then Lustrum is outer edge of even that. Look for Lustrum at out in the snowiest areas of the Reach. If you hear your crew talking about the Mother of Mountains, you’re getting closer. Lustrum is the port at the MoM. A most unlikely person there is the one to talk to. As far as taking down ships from both sides, for a while it seems like you’re OK to do that. And then eventually either or both sides get sick of you doing that. At some point, you’re going to need to pick a side. 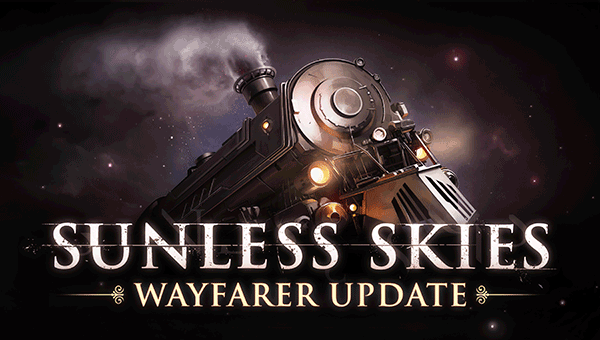 It’s been a couple of weeks now since we released Sunless Skies, and we’re really happy with how the launch has gone. This is, by some way, the best critical reception one of our games has ever had. Sunless Skies has been called “Failbetter’s finest hour” by PC Gamer, “Terrifying and exhilarating” by PCGamesN, “Essential” by Eurogamer and “A triumph” by Gamespot. And at the time of writing we’re at 87 on Metacritic, putting us right below a few little known games in their 2019 rankings called, umm, Slay the Spire, Apex Legends, and Resident Evil 2? Needless to say, we’re intensely grateful and delighted. Thank you to everyone who played Sunless Skies during Early Access: it couldn’t have become what it is without you. Sunless Skies is doing very well for us commercially, too. Far better than we needed it to do. We occasionally receive sympathetic enquiries about our financial health from the community; to be clear about that, we’re in a very good position, and now we’re really looking forward to spending several months further extending and improving Sunless Skies. In the next couple of months, we’ll be releasing at least one major update, with a focus on filling out the game with more to see and do while travelling, including more narrative choice and consequence and, of course, unusual ways to die. We’re not ready to say more about the details just yet, but we think you’ll like what we have planned. We’ll be working on more updates with other areas of focus after this as well, with plenty of new stories, gameplay features and other improvements. And naturally, we’ll continue patching the game to fix bugs and improve performance. We’ve already released three patches last week with more than 80 fixes and improvements; we’re working on another that should be ready in the next two or three days. Thank you again, for everything. We couldn’t have done any of this without your enthusiasm, your feedback, and your support. I am interested in this but want to know if it is any fun. Sunless Sea was remarkable for its writing and world but lacking considerably in actual entertaining game play. I’m not sure I can do “fun” as a gradient metric, but I can say this: the game has got an awesome “one more turn” (or in this case “one more port”) hold on me. The upgrade path on your ship/locomotive and the leveling of your captain are both excellent carrots. There’s also a pleasing dynamism to the world. I may or may not have accidentally provided the spark to a fuse of rebellion against empire in the home world of Albion for instance (though Albion certainly needed something of that sort to happen). Game came out January 31st. I’ve got about 20 hours in. For me, that’s AC: Odyssey/Witcher 3 levels of happy engagement. I wonder if I should wait to play for real for when those future updates come out? My gosh, when you upgrade to the Agravain-class ship…well. She’s got some serious get-up and go. Adjusting to the new turn radius is taking some time (I’ve left more paint on the walls of the docks at London than I care to mention). I am now zipping across the sky with tons of armor and twin Grimalkin cannons spoiling for a fight. Think I’m heading back to The Reach and picking a side in the fight there. I also just upgraded to the juggernaut today. What got me was the far more powerful side jet maneuver. The first time I tried to dock it I tried to made a small lateral correction and instead I slammed my bow sideways into the outer edge of station causing me to then spin out to the side of the slot. Excessive firepower early in a fight! When I open up with those babies, with most enemies it’s a pretty quick fight. Cool. Glad I waited to keep playing. Yeah…I appreciate post-release support…but also it invariably makes me wait to play (or in some cases, purchase) the game until they’re actually done with it, because I’m not going to play games multiple times.